“Without bunkai (applications), kata is little more than pre-arranged dancing. The hands can be flowing in exciting and vibrant ways but if we never discover the meaning of the motion then our time would be much better spent hitting a heavy bag or sparring. Bunkai is the key to developing useful and effective techniques preserved for us by those individuals who developed and tested them in fierce, life protection situations. Over the course of time much of the true meaning of these movements has either been lost or purposefully disguised. If your desire is to unlock some of the skills of our predecessors, you’ll need to know the right questions in order to find the best answers. The following are seven things to ask yourself that might illuminate your kata in a different (and hopefully productive) way. These are in no particular order and are not prescriptive. Use some when you can and invent others. 1. Can I change the angle in which I address my opponent? Many times during bunkai we assume that an opponent is coming straight from the front or from the sides, and that we must stay directly in front of them and try to defend. What happens if you cut a 45 degree angle during your technique? What if turning from left to right allowed you to arc around the same opponent instead of addressing a new one? 2. What came just before and what is coming right after? When we learn kata, it generally occurs in a set cadence. Step1 – block up. Step2 – block down. Step3 – punch kiai! That being the case, our mind generally sections itself off in those little boxes. It is our job to look at what is occurring right before our current technique and right after and how the body moves from one to the next. Stringing techniques together makes for a more devastating outcome to your opponent. 3. Am I utilizing all of the technique or just the end piece? Techniques are often more dynamic than we give them credit for. Take for example the knife hand block. When we perform a knife hand block we generally step somewhere, prep the block, and then shoot the block out. The block itself is what we use to defend against an attack, but what about all the stuff that came before it? Can’t we use that too? Can’t the body shift be used to off-balance or attack our opponent, and can’t the prep be used to either defend or attack? 4. Can I condense the number of opponents I have to face to get through my applications? If you find yourself going through a dozen bad guys for your bunkai you may be too segmented. In order to mentally escape from a tricky technique we often dismiss the current bad guy and invite a new one in from a different direction. Worse yet, if we are using two hands at once and don’t really know what’s going on we might invite two bad guys to attack us at once from different directions. Multiple opponent training is valuable, but kata is not suggesting that GuyA is likely to kick low while GuyB punches from behind. Those scenarios are too unlikely and miss the real intent of what’s happening. Condense the number of opponents as much as possible. 5. Are my opponents behaving naturally and with likely techniques, or am I forcing them into increasingly unlikely scenarios? Patrick McCarthy Sensei developed the acronym HAPV, or habitual acts of physical violence. The point of HAPV is to keep focused on the techniques you are most likely to encounter. Furthermore, the longer you make the string of actions done by your uke the more unlikely an actual attacker will follow that pattern. 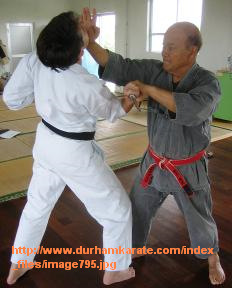 Therefore, when performing bunkai, we want our opponents acting as naturally as possible. If the opponent has to punch, step back punch, step back punch, step back block up and receive your strike, you’ve asked your uke to behave in a way they never would in real life. 6. Have I affected my opponent in a way that makes more technique work? Let’s say you manage to block your opponent (so far so good). You then put them in a wrist lock or arm bar in order to control them. That progression seems very effective, especially after years of training, and generally works in the dojo. However, if you’ve ever come across a live opponent who is experiencing adrenaline dump you’ll know that manipulating that arm is extremely difficult. Your attempts to bar or lock it will be met with iron resistance and counter punches to your face. Always be sure to negatively affect your opponent as soon as possible, then go into more technique. 7. What is the emotional content of my encounter? What kind of scenario is your kata taking place in? Is it a school yard pushing match? Is it a life or death home invasion? The emotional environment you place yourself in is going to alter your bunkai dramatically. Your technique may need to restrain or it may need to kill. With all of these questions/problems/complications we have to address the concept of simplicity. In a real life altercation, your simplest and most effective techniques will be the ones that help you. Thinking about responses in the heat of the moment will keep you one step behind your opponent. Why then bother with all of this business about bunkai? Shouldn’t we simply practice a series of basic, effective techniques and avoid the mental gymnastics? The short term answer is yes. For the first 5-6 years of your training you need to become “brilliant at the basics”, as Bill Hayes Sensei would say. Without a rock solid foundation and instinctual integration of your style’s stances, punches, and basic techniques nothing else can be built firmly. However, once you do achieve that level of proficiency, you acquire the privilege of exploring your art even deeper and improving the way you go about your business. Simple techniques practiced a certain way seem like the best option until you learn how to improve them. That doesn’t necessarily mean complicate them. Instead the goal is to find ways to improve your angle, distance, timing, striking locations, and technique progression in order to enhance what’s already been built. This style of study leads to an understanding of tichiki, or “what the hand is doing”, which can be used extemporaneously with great percentage of success”.